The Foundation is raising funds for 10-15 Daily Diary tags to be placed on Rockhoppers and Yellow Nosed Albatrosses to follow those that have survived the oil spill. We have no idea how many Rockhoppers will return in August – how many made it through the oil following their molting season and moving out to feed. It is not looking good. Salvage crews are due in late July – guaranteed to spread further oil and byproducts into the water – the Rockhoppers swam out through the oil and will be coming back through it to reach their breeding grounds on Nightingale. Over 98% of those brought to Tristan for cleaning have perished. The tags are expensive $3,000. each. But they are extraordinary and will follow the wildlife 24/7. Help in any way you can. Thank you so much for your support. Update – 5/15/11 – On hold waiting for the Rockhopper counts to begin in August when they return to Nightingale. Until the penguins return in August for the next breeding season, we won’t realize the full impact of this oil spill. Even then, we still won’t have all of the answers to these questions. But, when they do return (after spending months feeding at sea in preparation for the breeding season), conservation officers on the islands will be able to conduct nest counts, which should give us some indication of how many penguins might have been lost that were not accounted for at this time. To fully understand the long-term impact the MS Oliva oil spill will have on this pristine region, and on the endangered Northern Rockhopper penguins, will require long-term monitoring. This project will require a great deal of funding – and it will not be covered by the ship’s insurers. 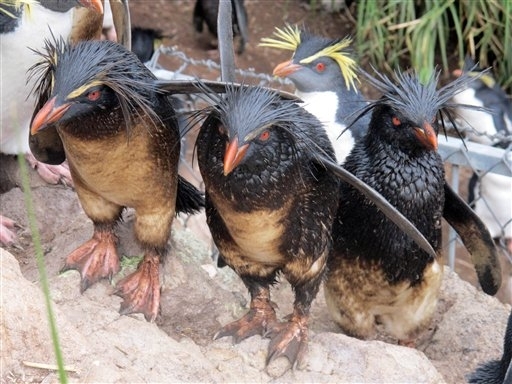 Oiled Rockhopper penguins at Tristan da Cunha being washed and rehabilitated – long term impact of the MS Oliva oil spill on the population still in question. The latest reports indicate that the recovery of any more oiled penguins from the islands in the Tristan da Cunha island group has probably concluded. Conservation officials on the islands have said they believe that all of the live oiled penguins have now been collected and brought to the rehabilitation center on the main island (Tristan da Cunha). This temporary rehabilitation center was constructed after supplies and staff from SANCCOB (Cape Town’s seabird rescue center) arrived on the tug, Svitzer Singapore, on April 5th. Extremely rough seas made it nearly impossible to access several of the islands over the last week or two, but now that a helicopter has arrived (as of last Tuesday on the Russian research vessel, the Ivan Papanin), they should be able to conduct more thorough surveys of the islands. The good news is that the rough seas have helped to break up the oil in the waters surrounding the islands. Once the Svitzer Singapore arrived from Cape Town with frozen fish and cleaning supplies (including detergent, wash-tubs, degreaser, toothbrushes, hot water heaters and infrared heat lamps), the training of volunteers and cleaning of the oiled penguins could finally begin. Which was a tremendous relief. However, these birds had been coated in toxic oil for so long that they were in a very compromised state. In the past week, 1,577 of the 3,718 oiled penguins died. At this point, the exact cause of these deaths has not been released. But we do know the following from previous experience; an oiled animal will compulsively preen or groom itself (a penguin uses its beak to do this) so they ingest the toxic oil covering their bodies. This leads to dehydration, anemia (the red blood cells get broken down from ingesting the oil, and they also get bleeding ulcers), and other health issues. Eventually, this long-term exposure to the toxic oil can kill them. So, the ideal situation is to get the penguins washed as soon as possible once they have been oiled (after giving them 24-48 hours to stabilize after being captured and transported). But, unfortunately, due to circumstances beyond the control of the islanders and the conservation officers stationed there (and the penguin experts coming from Cape Town), the necessary supplies did not arrive until three weeks after the oil spill occurred. The hold-up was apparently on the governmental level in the UK (this island group is a British territory). We still do not have answers as to why the official response from the UK was so slow and insufficient. Had professional rescue teams (bringing necessary supplies) been allowed to go to Tristan as soon as this oil spill occurred, the lives of many more penguins would undoubtedly have been saved. The timing of this oil spill also was disastrous for the penguins, because they were just completing their annual molts (during which they fast for 2-3 weeks), and were already extremely thin to begin with. Before the Svitzer Singapore arrived with 20 tons of frozen sardines, islanders fished for local fish to feed the penguins – and even donated all of the fish in their personal freezers to the cause. According to the latest reports, the islanders are doing a wonderful job washing the penguins and nursing them back to health under the direction of the rescue teams. For more details on this, you can read last week’s article from BirdLife International Community, titled Wash and dry for rockhoppers at rehab center. This page from the official Tristan da Cunha website also has updated reports: Seabird Rehabilitation on Tristan da Cunha main island. So several questions remain; How many penguins died on the islands or at sea before they could be collected or counted? How many of the rescued penguins will survive, and how many will continue to breed after being rehabilitated and released? How will this oil spill impact the future survival of this endangered species? How will affect the local ecology of this island group? Will the oil enter the food chain, thus affecting the penguins and other seabirds further? At this point, the local lobster fishery has been shut down due to oil contamination. This fishery is the primary source of income for the 270 islanders living on Tristan da Cunha. How will this oil spill impact the islanders as well? I got word this morning that the ship from Cape Town has arrived at Tristan – frozen fish, rescue kits, supplies and much needed help – 6 members (I believe) from SANCCOB. The people of Tristan – under 280 total – are amazing and have managed to get over 5000 Rockhoppers & Seabirds off Nightingale. Another ship with a helicopter has just left Cape Town – this will make rescue efforts easier – understand it was requisitioned from the company that owns the ship that went down. Spoke to Richard Cuthbert at the RSPB/UK this a.m. – it may not be known for up to a year whether or not rats have come onto Tristan from the ship – this would be catastrophic for birdlife. Right now there have been no sitings of rats. This is ONLY THE BEGINNING. Please DONATE if you can – all amounts welcome! Our funds at F.A.R. go to the RSPB in the UK and are earmarked strictly for Tristan’s Oil Spill. I’ve been assured this a.m. that your donations will go to the most urgent needs on Tristan – supplies, boots, rescue kits, wash tubs, oil removers and FISH for the ROCKHOPPERS! TONS OF IT! THANK YOU SO MUCH FOR YOUR CONTINUED GENEROSITY. When you get to my page, just click the big orange DONATE button. It’s so easy you won’t even believe it! Tragedy has befallen one of the largest colonies of endangered Rockhopper penguins in the South Atlantic. On March 16, 2011, a carrier vessel from Greece called the MS Olivia ran aground near the coast of Nightingale Island (part of the Tristan da Cuhna island chain–see map below for details). The crew was rescued from the boat before it broke in half and sank to the ocean floor, releasing an estimated 800 tons of crude oil into the ocean. More than 20,000 penguins have been covered in oil, putting their lives and the survival of the entire species in jeopardy. To make matters worse, this very remote location is accessible only by boat in very rough seas. A small group of rescuers are working round the clock to save thousands of animals, but supplies are limited. A ship from South Africa is en route to the tiny island, which is roughly 1,750 miles west of the African continent. Unfortunately, poor weather conditions have slowed the vessel’s progress. This spill could not have come at a worse time for the Rockhopper penguins who were just reaching the end of their molting period. Most of the birds haven’t eaten for weeks while they transitioned from old feathers to new, because they can’t swim in the frigid South Sea without a thick layer of feathers to insulate them and provide their natural buoyancy. Now this entire species of penguins–listed as endangered by the International Union for the Conservation of Nature (IUCN)–is facing possible extinction if the world is not able to come together and provide the resources they need. Photo © National Public Radio, courtesy Bushwarrors.wordpress.com.